Comparing either Trump or Obama to Lincoln isn’t necessarily a positive exercise. Regardless, Trump is clearly the heir-apparent. When Barack Obama launched his presidential bid in 2008, he did so in the same place as another man who ascended to the presidency through Springfield, Illinois. The comparisons between Obama and Abraham Lincoln were not to stop there. With promises to preside not over blue America or red America but both Americas, hopes were high for the junior senator, although he was not to become the most Lincoln-esque president since Lincoln. As of this moment, the man most poised to claim that mantle is Obama’s successor, one Donald Trump. Before breaking out the tar and feathers, remember that Lincoln, despite reuniting the union, was no Grover Cleveland or Calvin Coolidge, about whom people have few and bland opinions. Some such as locavore farmer, author, and general provocateur Joel Salatin, go so far as to claim Lincoln is the worst president we’ve ever had, thanks to the latter’s creation of the Department of Agriculture. In Salatin’s words, “There is not another agency that has been so successful at annihilating its own constituency.” An understatement, to be sure, as Leviathan’s specialty is growth by cannibalistic annihilation, but it was a harbinger of things to come. That’s how we got Trump, a man who is not so dissimilar from the tall Illinois lawyer who wasn’t much into constitutional law back when the Union was dissolving. In other words, comparing either Trump or Obama to Lincoln isn’t necessarily a positive exercise. Regardless, Trump is clearly the heir-apparent. This isn’t to suggest that Trump is going to create the next Department of Agriculture, although it’s possible that DC will experience some growth during his tenure. Maybe it won’t. We’re in uncharted waters here. Still, there are similarities, even if we’re comparing expectations and predictions to a man we view through a historical lens. Nor is this suggesting that Trump will be in the Oval Office as we descend into civil war, although it’s not impossible we could move beyond dank memes and scathing Facebook rants and pick up some actual weapons. We’re still in uncharted waters here and, as a nation, we’re definitely not at the peak of understanding or even liking one another. Let’s start there. When Lincoln was sworn in in March 1861, seven states had already seceded, starting with South Carolina. Zero states have seceded since Trump’s election, although some Californians drove hard for the basket. Such talk has since subsided, but California could always go full South Carolina. In our time nothing is shocking, after all. Putting that aside, we are indeed a divided nation, as evidenced by the popular vote results. Also leaving aside until another day the argument about which of the states in that map represent real America, the real Constitution did set up an Electoral College, and that is where Trump prevailed. Let’s not liken that to 1860; that would be folly. Were there deplorable—to borrow a term from someone—elements to the election, including racists and nationalist elements? Certainly. But if you think that’s why Trump won, that’s how you get Trump. This year wasn’t America 1860 redux. Or Germany 1933. Back to the popular vote. Lincoln won it, but only by a plurality. He also won the Electoral College. Clinton may have won the most recent popular vote plurality, but it was still a plurality and not a majority. It also wasn’t the Electoral College. That’s where we are as a nation. 2016 was an election in which the popular vote was not in cahoots with the old EC. Don’t worry, we can work through this. Thankfully, we have a government that’s likely to offer a hodgepodge of things about which we can disagree, but many of us often disagree with some thing coming out of the fevered swamp that is our nation’s capital. Gridlock, baby, learn to love it. Otherwise, we might get this. While an entertaining-enough movie with maybe a lesson or two, the lesson one should not take from “Frozen” is that trade barriers are sound economic policy. This is particularly true when your sovereign isn’t a magical queen. The particulars of the relationship between Arendelle and Weselton are not sussed out in the film, but we can assume that the cash or gold coins or ice cubes or whatever went both ways. Those German automakers’ relationship with the United States also flows both ways, providing 33,000 jobs and a large number of exports. Lincoln may not have contended with precision-driving machines, but he did nonetheless nurture a strong affinity for tariffs. In itself this is unremarkable, but its part of the larger puzzle is undeniable, particularly as really granular types will insist on discussing trade’s contribution towards sparking the Civil War. It’s not that they’re wrong, but let’s be real about the cause. On the other hand, BMW does have a rather sizable factory in South Carolina, so let’s not completely write off the parallel. Of course, that assumes we’ll hear about them, because of fake news. The media didn’t exactly kick it this last cycle. In fact, they mostly stunk out loud, but that isn’t stopping Trump from threatening to lock them up. If he succeeds, he may actually have to thank another man who rode in from Illinois. While it’s true that it vastly exceeds 140 characters, it was nonetheless a rather epic mic drop. Lincoln wasn’t just pushing back against fake news, he wanted its creators locked up. You know who else wants muckrakers locked up? So maybe Trump hasn’t called for this to be suspended yet, but apparently it’s time to let our imaginations run wild, so let’s do that. Habeas corpus, Latin for “Yo, we’ve got the body,” is about whether government can detain you. During the Civil War, Lincoln wasn’t huge on checking this. We’re not in a civil war (yet? ), but there are claims Trump wants to detain a whole bunch of people. He hasn’t exactly said that, but let’s remember to let our imaginations run wild. You know who else didn’t win a swathe of states? Hitler, probably, but that’s not what we’re discussing. We’re discussing Trump. Whose presidency is maybe illegitimate. Although really it isn’t at all. Well, maybe it kinda is. In other words, he’s legitimate. Much like Honest Abe, who also faced such charges, albeit from a much more troubling direction, what with secession and all that. He didn’t let that stop him from talking tariffs, suspending habeas corpus, and trying to jail the press. 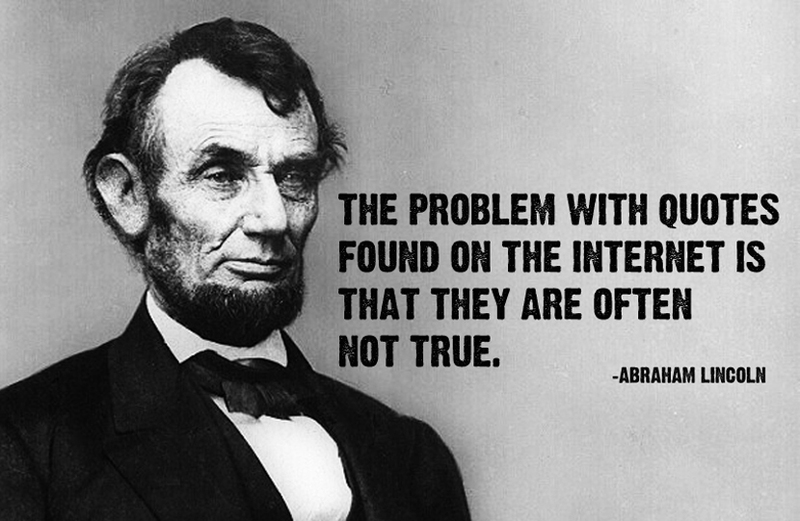 And that was before the Internet, which as he warned us, often contains untrue things. He would’ve had a field day with bloggers. Lincoln didn’t let the lack of bloggers or constitutional smackdowns stop him, though. No, he forged ahead, preserving the Union along the way. Were it not for that first secession, he might be remembered solely as a really tall guy who loved tariffs and didn’t much care for the Constitution. In other words, there’s still hope for Trump to be all the Lincoln that Lincoln ever really aspired to be. Sure, it won’t be great in a number of ways, but it probably won’t be devastating either. Hopefully. Let’s just not tempt fate with a full South Carolina. We’re looking at you, California. We often mock you, but you got this.